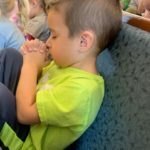 Children’s Chapel is a fundamental and distinctive part of Grace. Each week our 3-5 year olds attend chapel service with Mrs. Vicki, the GUMC Student and Family Ministry Director. Each teacher participates with their class. Children hear Bible stories, sing songs, participate in discussions and pray. Each week the children that have signed up for piano are taught by Mrs. Genesis Eaves, in a small group or individual lesson. Utilizing the WUNDERKEYS program, lessons are tailored to meet the needs of preschool-aged children ages 3-5 and to ensure that their first music lesson experience is both positive and enjoyable.